Or just to know your product. The Kano model has almost 25 years … but you can still easily apply it to your own Projects (IT or not). The strengths of the model : simplicity, and the user feedback (questionnaire). Thus, the Kano model is both a precious User Centered Design tool and a precious decision-making aid tool. 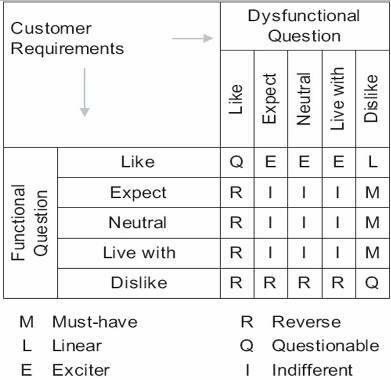 The Kano model seeks to connect requirements (response to needs, product attributes) and customer satisfaction, and classifies 3 types of requirements, that will influence the final customer satisfaction. Very useful and very efficient. These requirements are not a source of satisfaction but can cause major disappointment. They’re not the priority in term of development but must be there the D day. The need is expressed and customer satisfaction is proportional to the level of performance (and quality) of what is implemented. It is a strong source of customer satisfaction and a priority for Development. It must be shown as soon as possible to the Users. User feedback on these functions is crucial. These requirements are not necessarily expressed. Sometimes they’re unconscious. This is the happy surprise that can make a difference, and an important source of satisfaction. If not there, no dissatisfaction, no frustration: they’re not expected. Thus in terms of development, they are usually not a priority, except if it is your product or firm strategy. Exciters are the keys to Innovation. Obviously, the model is not fixed and a specific function tends to go to” “the Must have”). The mobile world is the perfect illustration. HOW DOES THE KANO MODEL WORK ? The model is very simple: select a representative panel of users (20 … 30), pass them a questionnaire, analyze the responses and make the right decisions. Analyze responses for each function and each user questioned. I agree on the value of this simple Kano model. For me there are two points often overlooked when folks discuss Kano. First, I believe Kano’s primary point was separating objective quality from subjective quality. Subjective quality has the nasty characteristic of being subjective – meaning humans need to evaluate it, not acceptance tests. Second, the results of a Kano survey like all surveys are a function of who you survey. If you create a product that has a diverse user constituency, then it’s common for some features to be must-have for some, and unimportant to others. More interesting is properly segmenting your customers or users and then looking at how particular segments judge a feature. For example some customer segments buying mobile phones consider removable rechargeable batteries a must-have. That wasn’t the segment apple chose to market the iPhone to. One of the clever things you can do with product planning is to wisely choose who your users and customers are, and aren’t. Then kick up the subjective quality from the perspective of your target customers. Thanks for your comment. You’re right the distinction between objective and subjective quality, and the distinction between users and customers are crucial for a design project. Funny … This is point we discussed during the Scrum Product Owner certification I attended yesterday in Paris. Arlen Bankston described it very well in a certification with a large focus on UX (user roles, story map, modeling, testing …). 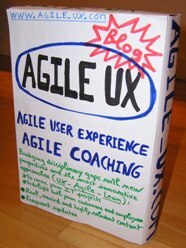 Good for the Agile UX movement !